Born geniuses are those who are bestowed with unparallel intellect and power of expression. One of such persons is Syed Imdad Ali Shah Imdad Tikhrai. He was born on March 20th, 1940 at Tikhur, Tando Mohammad Khan. He is a person of dynamic and revolutionary spirit, which he inherited from his grand father Allama Syed Asad ullah Shah, who himself was founder of Khilafat Movement in Sindh and multi lingual poet of Arabic, Sindhi and Persian. Imdad Hussaini received his early education from his native land and then enriched his existence by doing masters in Sindhi from University of Sindh. Along with studies, he also carried out part time job in Sindhi Adabi Board. Later he remained as librarian of Sindhi Adabi Board and with the passage of time he marked his position as Research Fellow in Institute of Sindhology, University of Sindh. He served at several positions like subject specialist of Sindhi, editor of Mehran magazine and secretary in charge of Sindhi Adabi Board. Presently he has dedicated his life for literature and is writing for his compilations of books. A: I started writing when I stepped in to Higher Secondary School. There used to publish a children magazine called Gulistan. I initiated my writings from that magazine. There was literary atmosphere at my village. Poetry flowed in our blood as my grand father was a poet of Sindhi, Arabic and Persian, while my younger brother was also a renowned poet of his times. Such kind of literary environment urged me towards writing, plus I had some internal voice of expression which boosted my interest in this field. Q: What do you feel about yourself, are you a poet or a prose writer? A: It could not be said easily, basically I consider my self as a poet. Writing is an internal mathematics which is expressed through tongue in the form of words. Where as poetry is a natural phenomenon like a poet expresses his and other's feelings through his thoughts and words. Poetry is a gift of nature. It could be polished by a poet unless its traits are present in you. Q: Who is your ideal personality? A: I get inspiration from simple people and learn from them because common men have our Language. Rest, Shah Abdul Latef is my spiritual leader because he started writing when Persian was official language but he wrote in language of people that was Sindhi. Shah's Risalo is such document which will guide us through out the coming ages. Q: How did you get your name as Sanwal? A: My family called me Imdad Ali Shah but there was an editor at Sojhro named Sehar. She called me Sanwal and later when my story was published, I gave wrote my name as Sanwal on that. Q: When your first compilation was published and what was your age at that time? A: First compilation was published in 1967 with title “Imdad ahay rol”. I was 27 at that time. Its cost was Rs.5 at that time. Q: Is there any wish that you want to get fulfilled? A: Personally there are many wishes but I want a change in scenario of Sindh and world so that humanity could prosper and our coming generations can lead a peaceful life. Q: Why our poetry has not crossed international barriers when we have heritage of Latif's poetry with us? A: Though we have boundless poetry of Latif but our institutions responsible for to prevail his message are not sincere in this regard. So those institutions should be managed properly. Q: Can anyone of us reach the heights of noble prize? A: Yes it could be achieved. Why not? When Dr. Abdul Salam can achieve that in science then why it could not be achieved in literature? I feel that if writings are translated into English then surely we can make our way up to that level. If talent will get proper promotion and our feudal lords abstain their activities of suppressing talent then we can achieve such glories. Muhammad Qasim Maka has multi dimensional personality. He is a poet, social worker and musician. Mohammad Qasim Maka was born on 3rd May, 1953 at village Maka Lakhi Ghulam Shah, Shikarpur. He completed his early education from his village and did matriculation from Government High School. Moving ahead in life, he passed Intermediate from Sachal College Hyderabad in 1972 with flying colors by securing first position and proved himself as best student of college. 1n 1978, he did masters in social work from University of Sindh. He also stood first in it. 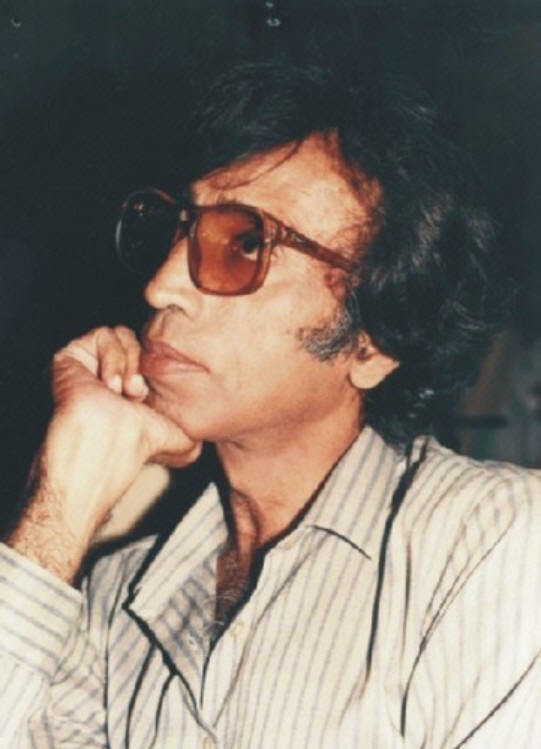 Mohammad Qasim Maka worked in radio, television and played active role to protect folk music of Sindh. Presently, he is working as director Institute of Sindhology. Q: How music inspired you? A: My soul relationship with music began in my childhood and I always liked to hear kalam of Shah Abdul Latif Bhittai at his mausoleum along with my parents. Sufism of Sindh inspired me towards music. Q: Which type of singers you used to listen in your childhood? A: I used to listen folk music of many singers but Sohna Khan Baloch, Master Chander, Baghat Kanwar Ram, Mai Jewrri, and Ustad Khan Mohammad are my favorites during childhood. 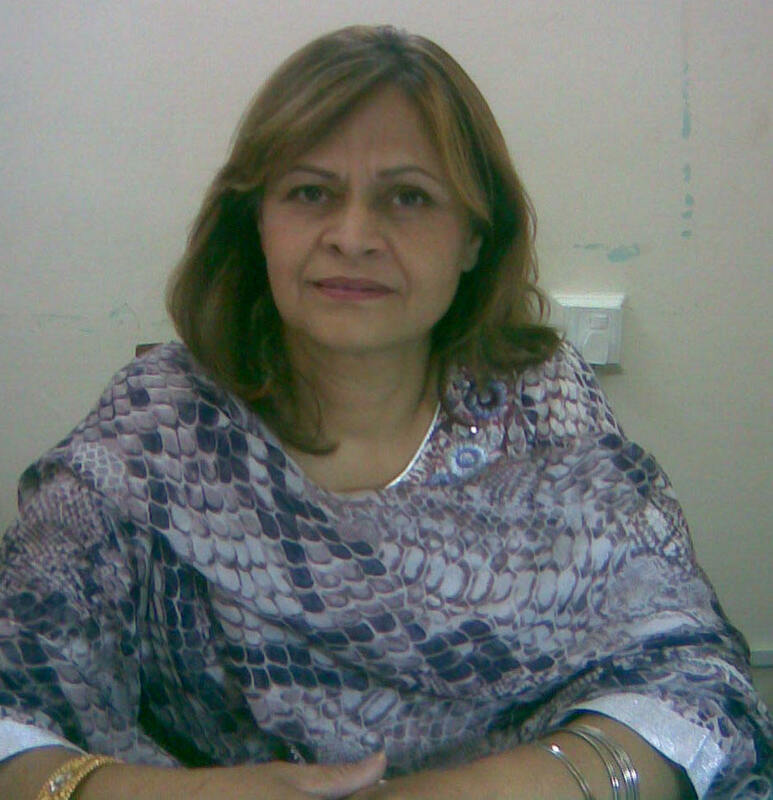 Q: Among classical poetry and music, who played a vital role to protect Sindhi culture? A: Folk music played a vital role to protect Sindhi culture. Q: Would you like to share any memorable day of your life? 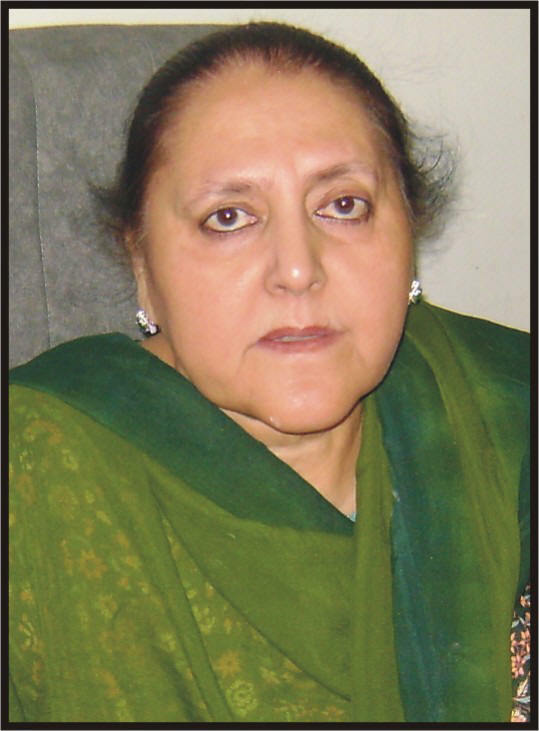 A: There are many but when I was selected as announcer at Radio Pakistan in 1971, I can not forget that day because it was my first step towards success. Q: Tell me something about Rang Manch? A: After KTN was launched as first private Sindhi channel, I found an opportunity to introduce a different type of program that could protect folk music of Sindhi language and then I started Rang Manch. Q: How many audio and video cassettes have you released in Sindhi music? A: More than one thousand audio and video cassettes have been introduced in market and this spiritual music got a positive feed back from audiences. Q: What role Institute of Sindhology plays in promotion of Sindhi culture? A: Institute had always and will keep safeguarding the culture of Sindh. It is and it will always transfer the culture to next generations. Q: What Sindhi people should do for the development of their culture and language? A: They should support their culture by wearing Sindhi dresses, reading Sindhi litereture and should have domestic systems according to Sindhi culture. Q: What do you say about the Shah Jo Risalo? A: Shah jo Risalo is back bone of Sindhi language and has a message for humanity. If one could read and act according to it then one would not harm others and vice versa. Noted artist and teacher Fatah Halepoto was born on Dec 13, 1938 at Kazi Ahmed, district Nawabshah (now Benazirabad). His family migrated to Dadu in 1942 and settled there. In his school age, he was very fond of playing cricket and this fond snatched his one leg forever in 1956. Due to this, his studies got stopped and a series of tireless efforts began in his life. In 1961, he came to Hyderabad for one year training at Art Teachers’ training centre Hyderabad and completed his one year training with second division. Later he completed his education during his service. He passed matriculation in 1973 and intermediate in 1976, he did graduation in 1979 from City College, Hyderabad. He was appointed as art teacher in district Dadu in 1962. He tried a lot to do MA but he could not due to financial problems and physical disability. He was very keen to join National College of Arts Lahore but again economic pressure and physical disability blackened his one more dream. He also filled so many scholarship forms to go abroad for higher education but could not succeed because of his straightforward nature he never adopted flattery means to go abroad. He was called back by Art Teachers' Training Centre Hyderabad in 1972 to educate teachers. After serving this institution for a long time, he took retirement in 1998. Since 1998, He has been working as free lance painter/artist. He got married in 1989 and has three daughters. He has organized his several painting exhibitions at national and provincial level. He also taught at Mehran Centre of Excellence for Art and Design for some time. He has been teaching many students privately without charging any fee and has given so many big painters to Pakistan. Fatah is not only an artist and teacher but symbol of courage which teaches us how to live with all odds. Q: Is painting just satisfaction of aesthetic sense or can it also be used for the reformation of society? A: Yes, definitely painting can be used for the reformation of society. I myself have used it as reformation tool. I satisfy my aesthetic sense as well but I also keep on thinking that how my skill can serve the society. Similarly I also keep in view art’s commercial aspect because it’s important. Aesthetic sense is first preference but your belly also requires food. So, both must go hand in hand. But just to paint for the sake of earning money is exploitation of art. Well, a true artist never lead life on barometers, measurements or calculations. Q: To what extent, you are satisfied with the compensations received by the painters for their paintings in Pakistan? A: I am adequately satisfied with the rewards received by the painters but not fully. Because if here I charge 10,000 for my one painting, then people argue that what will they do of a piece of paper by buying it for Rs10,000? Aesthetic sense is lacking here. I am not talking about those people who even can’t earn food for three times. How a hungry person can think of aesthetics? But I am talking about those who have money but they don’t have taste. Such people are just machines of making money. So in Pakistan’s big cities like Karachi, Lahore, Islamabad art is very popular and hence compensations for art are also good there but not overall. So that’s why painters prefer to exhibit their paintings abroad because a painting which is hardly sold for Rs50,000 here can easily be sold in for Rs200000 in foreign countries. But nevertheless, as compared to yester times, artists in Pakistan are getting good rewards now. Q: To what extent, a painter’s personal life and circumstances affect his imagination as well as his paintings? A: Personal life does matter. If an artist paints something but he’s not acting upon that in his personal life then in my view that painting is useless. Painter should not have a dual personality. A genuine and true artist never betrays or hurts anyone. The respect and reverence of his creation is that his personal life must have some compatibility with his creations. If a painter's own life is very tragic then it doesn't mean that his paintings reflect tragedies only. But one must try to paint the positive lessons got from the tragedies of life because our paintings are our message to society. Q: Is painting just a God gifted ability or can it be learned by proper training? A: Firstly talent and then its polishing are important to become a successful painter. But everyone does not come out after becoming something from an institution. If you take a fine arts department, then everyone do not come out as leaned and skilled painter. They just study and memorize like a parrot, but they do not have a creative approach. I never try to impose my style on my students. I just give them a base on which they prepare their own buildings. I try to find out that what ability they have got regarding painting and then appreciate and polish that. That’s how painting can be learned. Q: Do you feel that in current glamorized and fast era, admiration and attention of people towards painting has been decreased due to presence of many other sources of entertainments? A: Yes this is fact. If we talk about current situation, boys and girls are blindly running behind glamour. Even some artists are also doing the same drama. But the artists of my age like Gul Jee never did this drama. Now youngsters are following the previous painters. But the achievement is not to become a painter, but achievement is to make your place in 1000 painters so that people wait for your creations that where is that painter's work, his paintings are always marvelous. But in my early childhood, I was very fond of painting birds, butterflies, and natural scenes. But when I became mature, then I also worked on communism. Then in my professional period, I worked on many social issues. These days our youngsters are a in glamorization and easy going shortcuts to achieve their goals. Q: How much are you satisfied with the work of new painters? A: I am very much satisfied with the work of new painters. Not all painters, but some are really doing quality work. I admit, the standard of my students' work is higher than me. I won't say that I was the king and others are pawns. Society always keeps on changing and searching for the new ones. But majority try to walk on easy paths. They don't practice and work hard. Now they are busy in chatting on cell phones all the time. Q: Do you feel that Media has been giving proper and required coverage to the field of painting like other fields of art? A: media is covering field of painting but not as much as it should. Especially in past, media use to highlight only those painters, who use to feed media. I personally have suffered from this approach of media. Once, my exhibition was not covered by national media as I did not have enough money. Although situation is better now but still this defect is prevailing here somehow. Q: What role can media play in widening the scope of paining in Pakistan? A: Media can play an outstanding role in this regard if it’s true and objective. It can change the fate of a person. Now a day, world is completely moving on media’s information. Whoever denies the importance and strength of media, he is a fool. But approach to media is conditioned with money or friendships with media’s people. So this is a bitter fact that there are some charges of coming at media’s forefront. 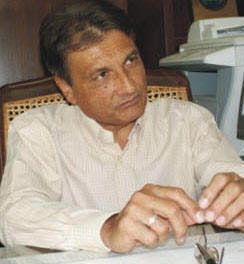 Professor Muhammad Rafique Dhanani is Chairman Department of Geography, University of Sindh, He did his M.Sc in Geography from Karachi University in 1976. Q: What was your second choice of career after teaching? Ans: I am fully satisfied with this profession of teaching because it is a sacred profession. If I were not a teacher I would had preferred to be a representative of our country in any foreign country. I was fond of location and culture of different countries and to see those countries, therefore, wanted to choose the profession of a diplomat. Q: After taking charge as chairman, what changes you have brought in the Department? Ans: Due to limited resources a computer lab was established in 1997 with two or three computers. Now that number has increased up to 14. The department building is old there is less space as the numbers of students are increasing. Priority is given to renovate and expand the department building to solve the problem of space. Q: Will you tell our readers about the scope of Geography? Ans: Geography is a multi-disciplinary subject in which knowledge of Physics, Chemistry, Agriculture and Demography is combined. While Geographic Information System (GIS) and Global Positioning System (GPS) are the latest addition. So student can easily choose any career after specializing in any of these fields. Whatever and wherever any thing happens in the world, people from different backgrounds want to know from geographers about location and reasons as well as solutions. Q: What are your major achievements in life? Ans: I have achieved the status as dreamed by my father. He used to discuss about my studies and future occupation with his friends. One of his friends advised him that your son must study geography which is related to planning. I opted to study Geography at Dhaka University in 1969. Q: As a chairman, what are your plans about up lift of department? Every person has different qualities so for every one is different and unique to other. Some people are distinguished for their intelligence and efficiency while others mark their identification through their unique acts in the society. These all things are not related with Naseer Soomro but he is different and unique from others by having a height of 8 feet and one inch. Who would have wondered that tallness of this man would become his identity someday and would become the center of attention for a large portion of world? 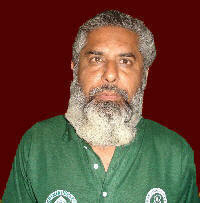 Naseer Soomro was born in 1975 at Shikarpur. After completing his primary education from Hathi gate school, he completed his Intermediate from C&S Government Degree College Shikarpur. He joined Shah Abdul Latif University Khairpur for graduation. Being tall, Naseer Soomro soon became very popular, not only in Pakistan but also at international level. He earned popularity with the unique symbol of creation by God and gained central position throughout the world. 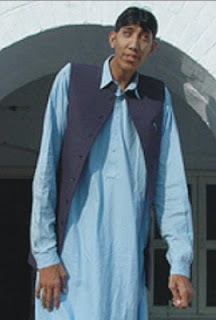 After Aalam Channa passed away in 1998, Naseer Soomro got title of being the tallest man by Asian and European media. Now, according to height, he is at 2nd number in the Guinness Book of World and at 1st number in Pakistan till today. Naseer Soomro has visited 19 countries of world just because of popularity in regard of his height. Among them France, Germany, Saudi Arabia, China, America are worth mentioning. He tells about his growing height that he was completely normal in his childhood, but at the age of ten years, his height grew up rapidly because of sudden fast fever. When he visited a doctor for checkup, he was told that because of growth hormones disease, his height is increasing quickly. For stopping this growth, doctors suggested operation. But due to financial problems it was not got possible. Naseer Soomro, where he gets so much love and respect because of being unique, there he also faces challenges. He can not travel comfortable in car, rickshaw and van. He always avoids these needs of transports. When he goes out side in the market or some place of outing, he is surrounded by odd eyes of women and children as if he is a man of some other world. At times it also happens that children get afraid of him and change their routes and paths on which he walks. It hurts him a lot and he feels shame. He likes sky blue color and is fond of vegetables. In 1999, he got a job in Pakistan International Airlines, but he was terminated. After that he is unemployed till today. Now days, Naseer Soomro is facing a lot of challenges for the survival of his family. Soft hearted, cheer full and master of great nature Naseer Soomro is also famous with his used clothes and shoes. In Pakistan, Naseer Soomro is spending a life of unemployment, though he is offered jobs of handsome salaries by different countries but this great man prefers to lead an unemployed life in his own land then to serve some other country. He says that life is the name of ups and downs. His friends have supported him in every step of life. He loves his friends and family. He is not only unique by his stature but he is also unique by his thoughts, loving nature and purified soul. Thatta is the tail-end area of Sindh and ongoing water issue has made residents restless. Advancements in the field of Information Technology indicate the fruitful outputs of any nation. “A person is unemployed if he or she does not work during the preceding week but made some efforts to find work for the past four weeks”. Teach him to close his ears to a howling mob and to stand and fight if he thinks he's right. Treat him gently, but do not cuddle him, because only the test of fire makes fine steel”, these unparalleled words were rolled down in the streams of history by Abraham Lincoln. He asked the teacher of his son to teach him the elegant way of living. Ages passed on and people kept on coming and going on pages of world. But only few projected the essence of these tremendous words. Today, few stand apart from this world and posses their own identity. 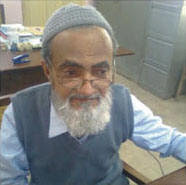 One such person is Professor Doctor Hafeez ur Rehman Memon. He was born on February 1, 1958 in Diplo district of Tharparkar. It is a vague perception in our country that people living in urban areas can make distinctions in the world but Dr Hafeez proved it and set an example that achievers do not need conditions, they are born to live a life of prominence. His primary and higher education was from schools of Diplo and Tando Adam respectively. To excel his education for professional career, he opted to do bachelors in Chemical Engineering from Dawood College of Engineering and Technology Karachi. After completing his formal education up to graduate level, he performed his duties as Apprentice Chemical Engineer, Mehran Sugar Mills Tando Allahyar to earn his living. Later, he switched his profession to teaching and was appointed as lecturer in Mehran University of Engineering and Technology, Jamshoro. Though he switched his profession to teaching but being a teacher, his thirst for knowledge never ended. Therefore, he intended to do Ph.D and did it successfully from University of Leeds, UK in 1996.He also posses additional qualification of Post Doctoral fellowship which he did from University of Leeds, UK in 2002-2003. He offered his duties as visiting professor at Napier University, Edenburough UK. 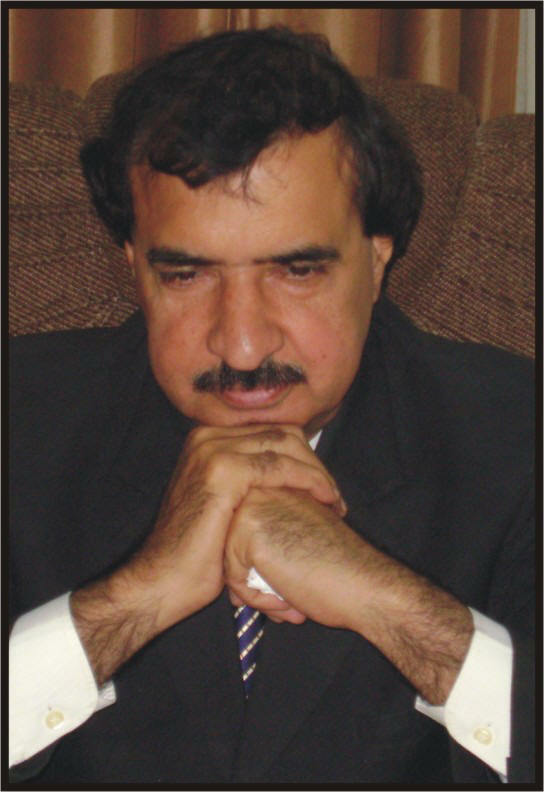 Today he is serving as Director, Petroleum Engineering at Mehran University of Engineering and Technology, Jamshoro. Having an experience of 25 years in the field of teaching, research, administration and industry, Dr Hafeez has proved himself as one of the successful persons of world. He is currently affiliated with Pakistan Engineering Council, Chartered Institute of Environmental Health of UK and Institute of Engineering Pakistan. Dr Hafeez believes in healthy body along with healthy mind. He is fond of badminton and table tennis. In his school days, he used to play football. He plays chess for mind exercise and walks to keep him hale and hearty. He is gentle and polite in nature. He opines that it is far honorable to fail than to cheat. He has faith in his own ideas. He helps students to get internships in industries. He is supervising five PhD students as he is a recognized supervisor by Higher Education Commission. His recognitions tell the story of his hard work, determination, struggle and finally a triumph life. He is a symbol of hope for those who believe that we have expertises who are not only expert in their fields of life but are also men of immense rectitude.